After years of outright begging -- and even a Change.org petition -- from people with dairy-free diets, Ben & Jerry's has created its first-ever lineup of certified-vegan ice cream flavors. In other words, people who can't or choose not to consume milk can finally stress-eat a pint of Chunky Monkey on a bad day, just like everyone else. The four new flavors -- two of which are classics, two exclusively non-dairy -- are made with an almond-milk base and are free of any animal products, like eggs, honey, and of course, cow's milk. 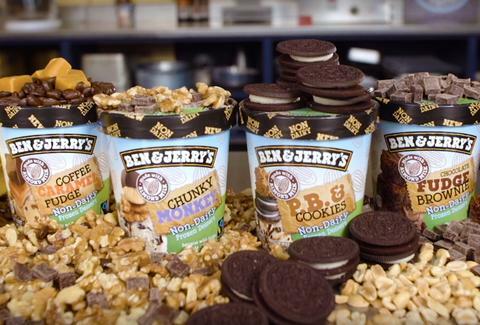 However, Ben & Jerry's Flavor Guru Kirsten Schimoler claims the quartet of ice creams, or "non-dairy frozen treats," come packed with the same crazy indulgent chunks and swirls as their cream-based counterparts. Pints of the four new flavors will hit frozen dessert aisles near you this month and will retail for about $6. For vegans who've missed out while their friends enjoyed ice cream all these years, it'll probably be worth every penny. Tony Merevick is Cities News Editor at Thrillist and has been craving ice cream for months, but has continually failed to treat himself to some. Send news tips to news@thrillist.com and follow him on Twitter @tonymerevick.